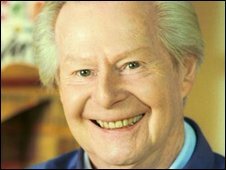 TV artist Tony Hart has said that not being able to draw any more is "the greatest cross I have to bear". The 83-year-old has been robbed of the use of his hands after having two strokes, he told The Times newspaper. "It has been my lifetime passion, but I endeavour to stay cheerful as there is nothing to be done about my condition," he said. Tony Hart appeared on art programmes for nearly 50 years before retiring in 2001 because of health problems. The artist is now looked after by two live-in carers at his home in Shamley Green in Surrey. "My whole life has changed since my strokes," Hart wrote in The Times. "After breakfast I would adjourn to my studio, built in my garden, until 4pm when I would change my shoes and set forth on a four-mile Gurkha-pace jog through the Surrey hills. The artist served as an officer in the 1st Gurkha Rifles in World War II, before joining a course at the Maidstone College of Art. He first appeared on Saturday Special as an illustrator before fronting shows such as Vision On, Take Hart and Hart Beat. "My aged heart is warmed by the lovely letters and emails I receive, especially when they tell me that my work on television inspired the writers to become artists," Hart added. Although the artist is no longer able to sign autographs, he still makes personal appearances when requested to speak or judge competitions.